If the discipline of ethics can have its 'metaethics', then the discipline of bioethics can have its 'metabioethics'. This book would be a notable contribution to such a discipline. Based on a symposium held at the University of Central Lancashire in Preston, England, this collection presents an insightful set of readings which question a range of assumptions and methods in contemporary bioethics. The first of these assumptions is that bioethics is an instance of applied ethics in which philosophers are the appropriate experts. In essays by Rebecca Bennett and Alan Cribb and by Mairi Levitt the pre-eminence of philosophy is challenged with allegations that philosophers do not listen to the voices of clinicians, patients, and lay people, and are insufficiently critical of the social construction of many bioethical issues and medical facts. Given these charges and the appeal for a greater role for the human sciences that they support, it is striking that the bulk of the thirteen essays in the book are by philosophers and clearly exemplify philosophical methodologies. 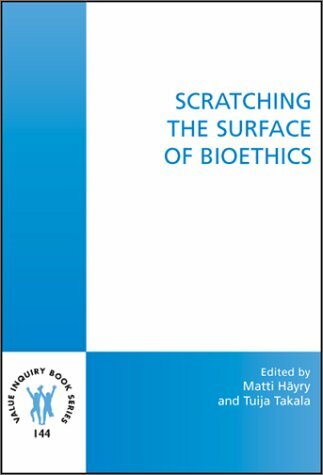 While it is doubtless true that there is a lot of interesting research that might be done around the social circumstances of the problems with which bioethics concerns itself, the authors of these opening essays need to ask what the goals of bioethics are. The most obvious of such goals would be to assist in the formulation of public policy and law in relation to ethically sensitive issues within health care practices and in relation to technological possibilities raised by advances in medical science, and also to assist individuals in making conscientious decisions about such matters in clinical contexts. Insofar as these goals are action guiding, it is clear that moral philosophy does indeed have a central role to play. There is no doubt that philosophers should be apprised of all relevant facts and should draw upon relevant research, but it is not clear why such research should be called 'bioethical' if it is not engaged in within the context of these kinds of goals. Bioethics should certainly be multidisciplinary, but it is centrally normative and hence dependent upon the methods and theories of moral philosophy. But these theories and methods are themselves highly discussable. Should we accept philosophy's focus on reason at the expense of appropriate emotion? Tuija Takala argues that 'sense and sensibility' should both be taken into account. Some utilitarian arguments illustrate how pure reason can be oblivious of the sensibilities of people affected by their prescriptions. Nevertheless, feelings by themselves cannot guide ethics because they are contingent and equivocal. This essay ends with the programmatic suggestion that morality should be 'minimal' so as not to make claims that cannot be widely accepted in a pluralistic society in which people's sensibilities on bioethical issues differ so greatly. The standard response of philosophy to such a variety of convictions is to move the discussion to the higher level of moral theory so that appeal can be made to universal norms. This in turn has been challenged by those bioethicists who stress the particular and social character of bioethical decision making. These critics suggest that consequentialism, deontology, and other moral theories are insufficiently action-guiding and are often not incompatible in what they concretely prescribe. However, Eve Garrard and Stephen Wilkinson insist that moral theory does make a difference. Whether one stresses values in outcomes or adherence to duty does alter one's perspective, and whether one thinks that morality has a transcendent standing or is merely an instrument for social harmony relative to the values of a given community will also alter the way that one does bioethics. Bioethicists carry hidden theoretical assumptions which enter into their disagreements and intuitions at a number of levels. There can be no reflective equilibrium within one's own intuitions or between the convictions of disputing parties unless those assumptions are explicated and debated. Søren Holm then turns the book's attention to a logical structure that bioethical debates often evince: namely that of 'parity of reasoning' arguments. Such arguments involve seeing what a person agrees with in one context, arguing that a different situation is relevantly similar, and then concluding that that person should be committed to a given policy in the new context. An example is James Rachels' well known consequentialist argument that, in the context of the drowning cousin in the bathtub, there is no moral difference between killing and letting die. One is meant to conclude that there would be no such moral difference in the case of euthanasia either. The problem with such arguments, it is suggested, is that there can be salient differences between the contexts. Everyone has to interpret the situation, and various interpretations, especially with reference to the intentions of the agent, can be given. There must be a reasonable point at which one can refuse to see that parity applies in the reasoning. But the irony of this argument, which follows the essay that espouses the relevance of theory, is that it effectively refutes general moral reasoning in favour of 'particularism'. If the application of a conclusion from one case to another requires careful interpretation of the new situation, it would seem that general considerations lack weight. What does have weight is careful and sensitive interpretation of particular circumstances. If every situation is unique then not only 'parity of reasoning' arguments, but any appeal to general principles or moral theories might be otiose. In order to defend the role of reason in bioethics, Harry Lesser tackles some criticisms made by Anne MacLean against 'ethical rationalism'. The most notable of these criticisms is the Wittgensteinian point that it is not general or universal principles that ground ethical rightness, but practices. It is practical contexts such as health care practice that ordain what is right within bioethics while the practices themselves cannot be justified because they rest on unchallengeable intuitions. If some are better at doing the right things than others, it is not because they have rational expertise but because they are more serious in their commitment to the values of the practice and more discerning in pursuing them. This is clearly a very important and challenging claim and one that a brief essay cannot do justice to. But Lesser does not help his case by adopting a rather naïve position. He accuses MacLean of relativism and puts the familiar point that relativism leaves a culture or a practice without any sources of criticism or reform. But this is a furphy. A practice is not monolithic. People of virtue can discern problems with unethical but widely accepted practices, even if they are participants in those practices. It is arguable that this process does not require appeal to general norms or rights, but sensitivity to the values inherent in the practice itself. Lesser is right to say that practices must be open to question, but the issue is whether this is done with reference to external principles or to internal values. Lesser concludes his essay by suggesting that reason should not be supreme and nor should feeling and practice-relative intuition. Rather there should be reflective equilibrium. One's (socially relative) intuitions should be honed by rational reflection. But this, I would argue, is consistent with the sophisticated form of relativism that MacLean espouses. One of the charms of a collection of essays like this book is that one can often discern possibly unintended differences in opinion between the authors. For example, in a closely argued essay which examines Beauchamp and Childress' widely taught form of 'principlism', Peter Herissone-Kelly could be seen as disagreeing with Lesser and, perhaps, Garrard and Wilkinson. He argues that the notion of the 'global applicability' of a universal common core of morality which Beauchamp and Childress appeal to is not sustainable. Rather he suggests that the norms which are necessary to any morality have a number of differing possible 'specifications' depending on context and that bioethics may present differing contexts in different countries. For example, Beauchamp and Childress' own specifications of their principles might be somewhat American. Herissone-Kelly also rejects the 'transcendental argument' for such a common morality which says that we cannot criticise aberrant cultures unless we have trans-cultural norms. As a result, argues Herissone-Kelly, principlism fails both as an empirical and as a conceptual theory about how a 'common morality' applies to bioethics. Charles A. Erin is also concerned with Beauchamp and Childress' four principles and, in particular, with Raanan Gillon's espousal of them. While making clear that their proponents do not see these principles as a decision procedure or as a moral theory, Erin is concerned that most medical students and clinicians will use them in just that way. Erin insists that the 'checklist' approach is inadequate and that clinicians should study moral theory in order to give a deeper ground to their decisions. But a particularist or Wittgensteinian view on this would be that, while ethical decisions may be hard to make, this is not because they are theoretically difficult and require the prioritising of principles. It is because they require a sensitive awareness of what is important for health care practice in the concrete situation. Matti Häyry also mentions the four principles of Beauchamp and Childress but in the context of a different issue. He asks whether bioscientists need a professional ethics. Only if they constitute a profession would they need a professional ethics and he urges them to become a profession so that they will be free of external regulation. But their choice of a professional ethic could direct them to the American principles of Beauchamp and Childress or to European principles which stress human dignity and a precautionary approach which urges agents to prevent even harmful effects which they cannot foresee. In either case, guidance would depend on the many interpretations that these principles could be given and, in the European case, such guidance would rule out virtually all genetic research. John Harris' essay operates less at the 'meta' level of the rest of the book than at the more concrete level of bioethical debate. It is a vigorous attack on the Catholic 'Pro-life' position as propounded by David Oderberg. Harris contends that this position is actually anti-life. For example, it allows killing in cases where that killing is an unintended effect of actions which have a non-malevolent purpose. Moreover, the prohibition against killing often results in more deaths. So, the refusal to kill one conjoined twin in order to save the other often results in the death of both. Harris' critique is devastating but his own consequentialist outlook seems to blind him to the real purpose of the traditional position he is attacking. Why would someone who propounds the sanctity of life not take these consequences seriously? Harris does not seem to notice that the Catholic position is not actually a sanctity of life position: it is a sanctity of conscience position. The important thing is not the outcome of the action, but the innocence of the intention. A thorough critique of the Catholic position would have to challenge its other-worldly metaphysics in which outcomes in this world are not as important as the salvation of the agent's soul. But, as we have seen, utilitarianism is not the preferred position of many contributors to the volume. Simo Vehmas is critical of arguments by Peter Singer and Helga Kuhse that suggest it would be a rational choice to prevent the existence of persons with impairments if those impairments were sufficiently severe. Vehmas finds that most utilitarian arguments (he also discusses John Harris, Julian Savulescu, Dena Davis, and others) presuppose a negative attitude to impairment. It is presupposed that a life of 'normal' ability is rationally preferable. But this discounts the experience of many impaired people. Down syndrome, for example need not prevent a happy life. He accuses Singer and Kuhse of inconsistency in their conception of utilitarianism. Whereas they espouse a Benthamite preference utilitarianism in which the happiness of individuals is paramount, they actually apply a Millian ideal utilitarianism in which some lives can be said to be better than others. Moreover, utilitarianism treats impairment as an individual problem. But it is also a social problem arising from the prejudices held against impaired people. Rather than focus on individuals and whether they should exist, there should be a focus on societies and how disability can be reduced for impaired people. Vehmas urges us to move, in thinking about disability, from thinking about deviance (negative departures from a 'norm'), or even thinking about difference (neutral departures from a 'norm'), to human variety (absence of a 'norm'). Only then can the utilitarian assumption that an impaired life is inherently undesirable or a moral harm to its owner be overcome. Mark P. Sheehan's essay addresses the conceptual problems surrounding paternalism, which he defines as a clinician deciding on what is good for the patient irrespective of what the patient sees as good. His claim is that the problem is not one of pitting beneficence against autonomy. Indeed, in critiquing unjustified paternalism, an appeal to the patient's autonomy is of less theoretical importance than an appeal to promoting the patient's good as it is seen by the patient. The advantage of this view is that it aligns the clinician's purposes with the beneficent goals of medicine. Autonomy and paternalism are also themes in Paul Barrow's concluding contribution. This essay is a wide ranging reflection on the role of bioethics in an aging society which focuses on the case of the Jehovah's Witness who (autonomously) refuses a blood transfusion. Whereas such a patient would have been overruled in times past, today's approach would be to regard an unasked-for transfusion as a case of battery. What stand should a clinician take in such a case? The solution that Barrow hints at is to deepen the notion of autonomy in a Kantian manner such that it is not just a right or a condition that grounds that right, but a prerequisite for dutiful and responsible action. In this way the clinician's autonomy is also relevant and could motivate a responsible refusal to be part of any procedure which would not be considered medically best for the patient. This book is an excellent collection of essays which are accessibly written, relatively short, and highly thought provoking. Clinicians, caring professionals, philosophers, and students who have some familiarity with the bioethical literature will gain greatly from reading it. If the maturity of a discipline is evidenced by its willingness to reflect on its own assumptions and methods, then this book is a mark of such maturity in bioethics.